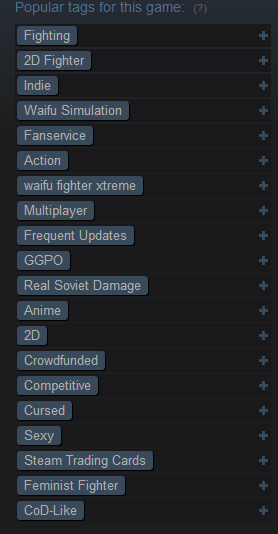 Steam tags for what game exactly? I definitely have had many of the same discovery trends over the past few years, including following journalists, and falling off from following journalists. I definitely am more likely to play games that are discussed as "interesting" though, over the next fun game. I'm not sure if this had occurred to you guys (or maybe it did, and you just didn't wish to appear conceited?) but you guys have definitely shaped my playing choices for the last several years. For example, and I think I've commented to this effect before, I didn't really care for BioShock, and I probably would not have given BioShock 2 a chance except for your discussion about it. Hah, that's humbling but flattering. I'm just happy to spread the gospel of BioShock 2.